You don't need to invite that one embarrassing uncle over to your New Year's Eve bash each year (we'll never forget the spaghetti incident of '93), but it can sure make the party more fun. Similarly, you don't need a good slicing or carving knife in your arsenal, but they're nice to have around during the holidays, when those big roasts make their way onto the table. Thinner and longer than a typical chef's knife, these knives are designed for carving and serving large roasts. I tested 10 of the best-rated knives in a few price ranges to come up with my picks. Why Do I Need a Carving or Slicing Knife, and Which Should I Get? A carving knife has a long, narrow blade that tapers to a sharp point. It's used mainly for carving poultry or bone-in roasts, like a leg of lamb or a ham. If you're really adept with your chef's knife, you might not need a separate carving knife—I went for many years without owning one, but now that I have a little extra space in the knife drawer, it makes for a welcome addition. I find it useful mainly because its thinner blade and extra length make it easier to maneuver around bones and cartilage. Carving the Thanksgiving turkey with a good carving knife is a joy. A slicing knife has a similarly long and narrow blade, but rather than tapering to a point, it has an even width all along its depth, with a rounded, bullnose tip. Its long, straight edge allows you to make even slices in the very largest roasts, like a prime rib or a boneless leg of lamb. I also use my slicing knife to slice very delicate things, like soft terrines or foie gras. Its length offers the capacity for tons of horizontal motion, which minimizes the need for downward pressure as you slice. 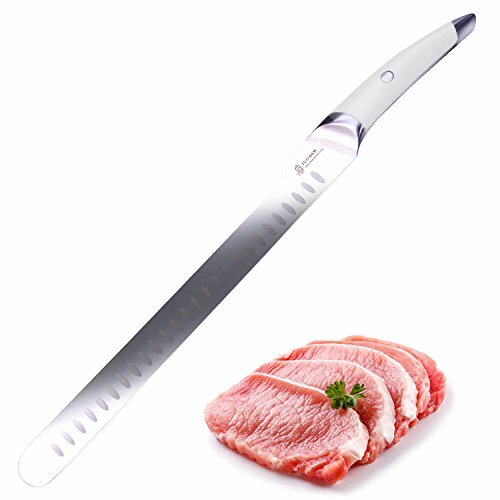 Virtually every modern slicing knife will have a Granton edge, featuring shallow divots in the face of the blade, which keeps slices of meat from adhering to the knife. The nomenclature for slicing and carving knives is not completely agreed upon, so you might occasionally see these labels swapped around. To test the carving knives, I carved whole turkeys and chickens, as well as bone-in lamb legs, into serving slices. For the slicing knives, I carved bone-in prime rib from the bone, then sliced it into serving slices. I also sliced lobes of foie gras into medallions. The sharpness and thinness of the blade are the most important qualities in either type of knife. For the cleanest appearance when serving, your goal is to make long, thin slices with as few strokes as possible. A blade that's too dull or too fat along the spine can make it difficult to move the knife through the meat without sawing. Flexibility is also important—a little give allows you to follow the contour of a turkey carcass or the curve of a prime rib bone. Comfort in the hand is another key quality. Does your hand feel natural when gripping the handle? Does the blade feel balanced with minimal work? Does the handle give you good control over the blade tip? Blade length is also a factor. The shortest knife I tested was eight inches, which is too short for some bigger jobs. I recommend a minimum of nine inches for a carving knife and 10 inches for a slicer. Steel quality and relative hardness and robustness can make a difference for knives that you use, abuse, and sharpen regularly, but they matter far less for a slicing or carving knife that gets pulled out only a few times a year and is used for only a few strokes each time. You're not really going to be using it often enough to dull it very fast. Luckily, because of their length and straightness, carving and slicing knives are also among the easiest knives to sharpen yourself if you ever have the need. Three of the four winning knives (the Wüsthof and both Mercers) are made of X50 Cr MoV 15 steel, which is a mid-range German carbon steel (marketers may call it "high-carbon," but its carbon level is pretty middling, at 0.5%) with good stainless properties. The TUO is made with 440A, a similar mid-range steel with a slightly higher carbon content (0.65%). All of the knives are good at stain resistance and come razor-sharp out of the box. The Wüsthof Classic Carving Knife was my favorite carving knife. I'm reluctant to recommend a $120 knife that you're going to be using only a few times a year, but it was simply the best of the bunch—it features an extremely sharp edge; a well-balanced, comfortable handle; and plenty of flexibility. It carves through roast turkey like butter, leaving very little meat stuck to the bones. It has a composite handle and a full tang to offer balance and support, with a bolster that is lightly angled and slim enough to make gripping the blade easy. If you do a lot of roasting and have a bit of cash to spare (and/or are looking for a special gift for a very close friend or relative), this is the knife for you. The Mercer Culinary Genesis Carving Knife is a great bargain knife. It uses the exact same steel as the pricier Wüsthof, which means that it's capable of getting just as sharp and retaining that edge just as long (though, out of the box, it's not quite as razor-like). The handle is textured soft plastic that's easy to grip, though the large bolster makes it uncomfortable to grip the blade with your thumb and forefinger (a.k.a. the "blade grip," which is the best one if you're after precise control). The blade is also pretty stiff, which means it can take a bit of work to get all of the meat off of a turkey. Still, for the price, it's sharp, it's made of high-quality materials, and it'll do its job just fine. I wasn't prepared to be impressed by the TUO B&W Series Slicing Knife. Everything about it, from the odd handle to the "Japanese" steel (which, as far as I can tell, has no connection to Japan) to the offset cutout in the blade screams "gimmick!" And yet, it was easily my favorite slicing knife, besting even pricier options. Its thin, flexible blade zipped through prime rib, the meat practically falling off the bone. Slices of foie gras separated from the main lobe with mirror-smooth surfaces. The really shocking part of this knife (aside from the price) is the unique handle and bolster geometry. Instead of maintaining an even width and thickness, the handle flattens out and widens toward the base. It looks strange, but it tucks really nicely under your pinky. The bolster is also angled, which makes it easy to pinch the blade for more control. * Just kidding. I could never give up a knife like that. He's just moved on to emeritus status. TUO makes other knives with similar handle designs, and I've ordered a chef's knife to test out. 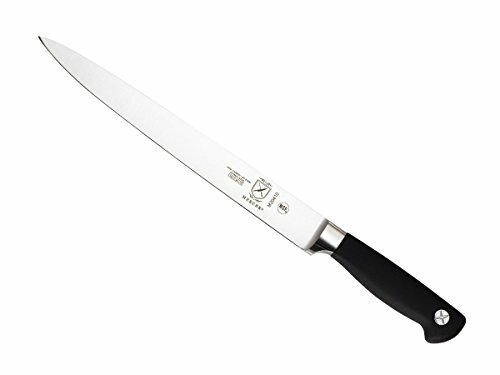 I'm worried, though, that even if I like the handle design on the chef's knife, the 440A steel might be a little too soft, even for someone like me who typically doesn't mind soft knives. Another good budget option from Mercer, the Culinary Renaissance 11-Inch Granton Edge Slicing Knife is also the runner-up in Cook's Illustrated's knife testing. (Cook's Illustrated's winning knife is far too wide and clumsy for my taste.) Unlike its carving knife, Mercer's slicer has plenty of flexibility to make taking the bones off of a prime rib simple. The knife is sharp enough out of the box, though it's not as sharp as the TUO. The big downside of the Mercer is the handle design. It has exaggerated curves that make it impossible to grip other than in a fist on the handle—forget about the blade grip here. The half-length tang also pushes the balance slightly off. Both of these are minor drawbacks, though, given the decent-quality steel and great price.